1 has been going for over a year, also the first one that I didn't do a complete all over design. I have 2 1/2 outer borders to finish the quilting. 2 & 3 haven't been around long but need to be completed & donated. Looks like some awesome goals, my goal is simple this month (Find my sewing room and work on something!) I have a couple of former WIP that have become UFO's So the first is to do a memory quilt that was promised over a year ago. and I have been looking at a denim quilt that needs to go back to church. I brought home a large stack of 5 inch squares and just doing a simple 4 patch, I am about 1/2 done. Unfortunately life, weather and machine repairs have gotten in the way. I'm all for goals. Pics...the computer has decided to upgrade and making the process so confussing, it's frustrating. #2 had 1 block finished, more complicated than I imagined, so got put aside. Recently pulled it out and got most of the top placed. Then another project got in the way. So I want to finish it this month. #3 was started last fall in memory of the Paradise/Camp fire in Northern California. We live in similar terrain-it could happen to us. The theme for the next gallery hanging is "Fracture" and I think this quilt shows how Paradise is fractured. It'll always have scars. There's talk of rebuilding it with fire prevention features and be a model for mountain communities. This is the highest priority for Feb. I'm here, but sorta inactive, as I'm a tax accountant. I won't be "up & running" for several weeks yet. May not be the mostest, but gotta be up there! heehee! hahaha for closing the drawer. I shall think about tha-at tamaarraw. Last edited by quiltmouse; 02-05-2019 at 03:08 PM. OH SBG...did you find a drawer that should've been left closed? Apparently I did! I was a champ today and did most of the quilting on the Chunky Churndash UFO. Yay! Also quilted a kid's I Spy, but it wasn't a very old quilt. Just put it together maybe a month ago, so it's more of a WIP than UFO. That Curtain Call looks like a great pattern for scraps! Whoa are there some admirable plans out there...great ideas folks. But oh my, quiltmouse...you counted and labeled them all...brave brave person! We will see you back some time in mid April! Yes SBG...each block takes about 20" of one color and 10+" of a second of a 2.5" cuts...think of all those bits of binding that are left over from a project (they usually read "solid") and pair it with a colorful match. It's from a book called "Slashbusters" made by Gathering Friends. Great idea for leftover binding! I have a "drawer" of novelty strips that are the leftovers from cutting I Spy squares. What a fun kid's quilt they would make. So are the squares 2.5" x 3"? 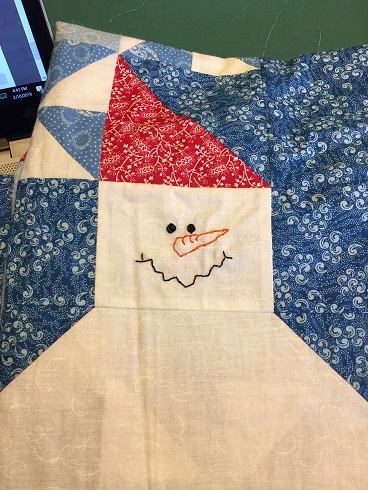 Sorry the book is "Stashblasters"
Made progress on my own UFO and also one of JJBlaine... She sent me her snowman quilt to embroider. Jess, I got 1/3 of the faces done. They are all different, all have orange carrot noses. So cute! On looking at the Chunky Churndash, I think I'm going to leave it with minimal quilting. I like the way it looks, soft and drapey... so I will leave it more like a comforter than a quilt. And on to the next! OMG! I am so excited and grateful! I can't believe you have so many little faces done for me already. I'm going to need to get busy on my other projects if I'm going to be ready to quilt it when you're done. This month I'm working on baby diapers and diaper covers for the grandson that is due on Valentines day. I fractured my wrist a little bit, so it is going frustratingly slow. As soon as I have those done, I hope to get some FMQ done on a Thimbleberries UFO. It was originally a Lap size BOM, but somehow I managed to turn it into an almost-king size quilt. I'm going to give it to a friend I have known for over 25 years. 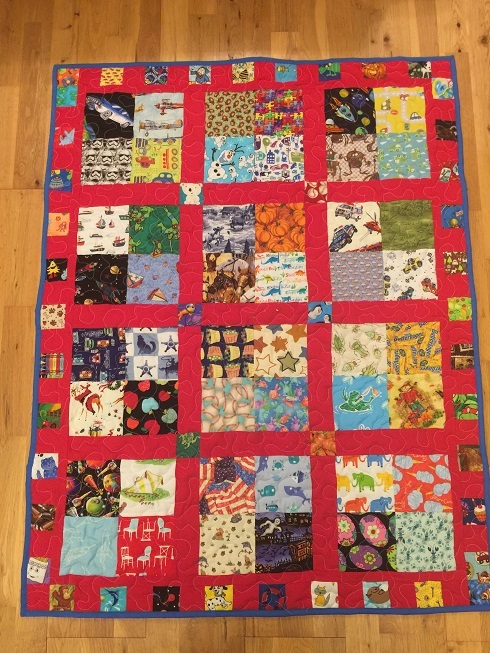 I made quilts for her kids (who are my godchildren), but somehow never got around to making one for her. Quiltmouse, I'm right there with you. I just have never taken an accurate count! Wow... no posts in 5 days. But... I have a finish! I got the Chunky Churndash all done and I just love it. I don't know why I let it languish so long. This was a UFO for at least 5 years, if not more. I think it was my oldest UFO. Now it's done. 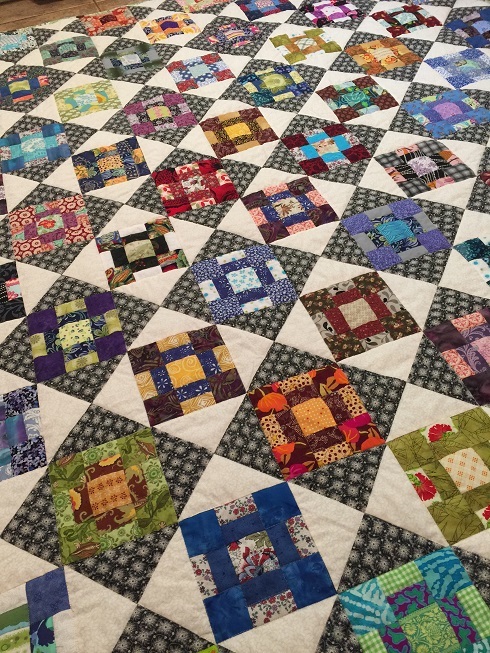 This is a free pattern on the Quiltville site. I made it a very controlled scrappy, carefully selecting perfect combos for each block. 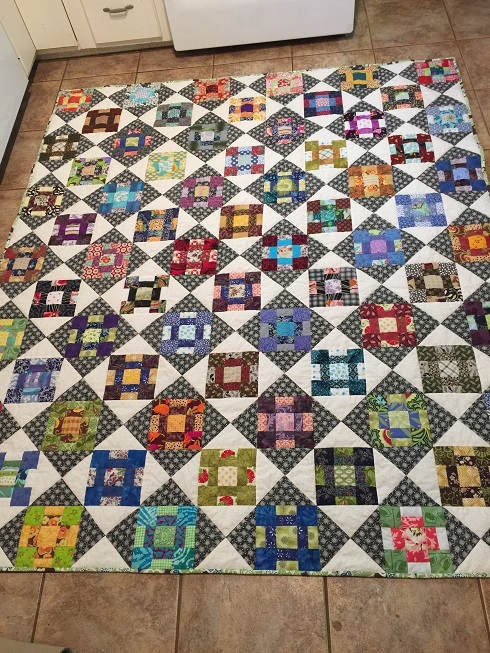 I also didn't over-quilt it. The batting is soft and I wanted the quilt to be somewhat drapey, not hard. And this I Spy is a shorter term UFO. And JJBlaine... 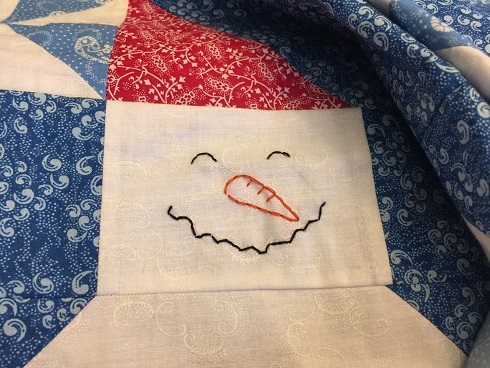 I'm embroidering the last 5 faces on your snowmen quilt. It will be in the mail to you this week! Nice finish, SBG. Very well unified design; nice contrast in the hourglass blocks. Soft and drapey is the best kind! 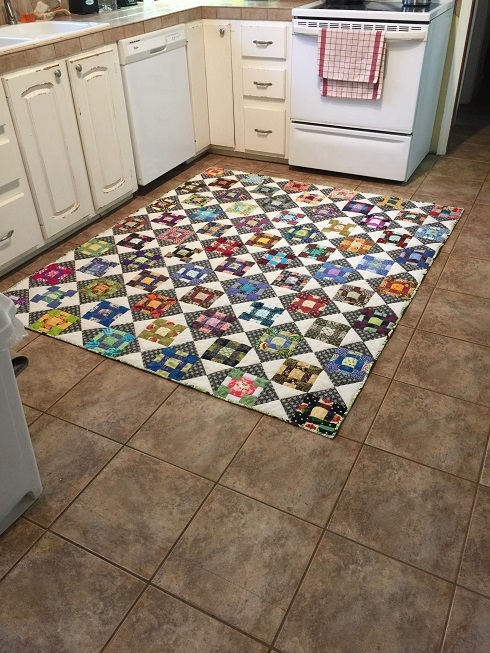 Congrats on your finish sewbizgirl, it looks great. Congratulations on your finishes, sewbizgirl! Lovely! Your snowmen faces are adorable. We had around 6.5" of snow today with more forecast for tomorrow night into Tuesday evening. We had a very nice winter until the deep freeze hit last week and now the snow. Lovely Minnesota weather! SBG! Beautiful fabrics on that CD! What a treat that one is! How big did it finish at? I think I'm creating UFO's by not being able to machine quilt my recent finished top. I'll have another done in a couple of days, which I never ever ever do.. (I can hear Oksewglad screeching right now...lol!!) I've never tried it on my travel machine...not enough throat space but I'm going to try it. I already have anxiety. Thanks... I didn’t measure it, but it should be about 66”x78”. Nice to sleep under! Bwhahahaha Teen is succumbing to the evil UFO land!! Meanwhile back on the farm, I'm working on a couple of new projects...Now really you say. When I asked my oldest GS if he wanted a t-shirt quilt when he graduates from HS next year...he replied "no"...well how about a denim one? Another "no, I just want a quilt, Gma." That set me thinking. I had a supply of plaid flannels and homespuns in all sorts of small chunks. I began cutting in the widest widths down to the smallest possible. These pieces I sewed end to end in long strips. I had enough strips to sew a 68 x 80 flimsy with plenty to spare. I then improv sewed a little crib quilt from the leftovers. Now to find backings for them to finish them off! Last year I declared it the year of the triangle and organized all the random triangles I have accumulated. I'm sewing Maverick stars with them stitching to 2 1/2" red squares. Also using scrap print squares for the center of the star...Oh yes another project going! Oksewglad, those projects sound so interesting. I hope you show us photos when they are done... or at least finished tops. I do have a few progress pics, SBG...I just need to get them uploaded...have a quilt guild meeting today...then another blast of winter! 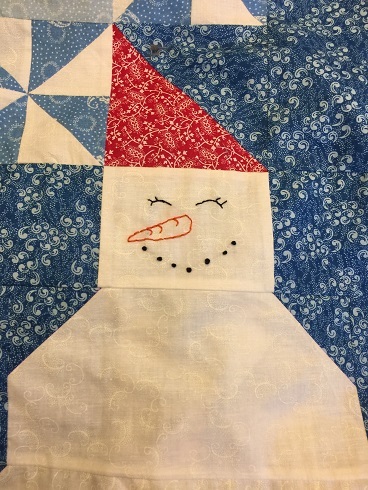 sewbizgirl, what a beautiful finish -- and the snowman faces are charming. I finished quilting the second quadrant of my quilt yesterday. Onward! Mid way through the month & I have completed a small round table runner binding. Started the binding of a large table runner. Completed the 1/2 border, starting on the remaining two. There is still hope, since I will be home again this weekend. Love those snowmen faces! They made me smile. Skipastitch: You are making good progress.